A new kitchen, bath or other home remodeling project can be a little overwhelming. At Platinum Kitchen Designs we understand that this is more then "just" a another job, this is your home and it needs to be perfect. Our process starts with a no-obligation consultation. One of our design pros will meet with you to discuss your vision, your goals, and your budget. We then outline the costs and services to be provided and present you with a written design proposal. Upon acceptance, we begin the actual design process by photographing and measuring the space, identify any construction, electrical or plumbing issues, and creating a schematic. The design phase is the really fun part. Based on the schematics that we create you will work with our designers to select layouts, choose cabinet styles and fixtures, and add special features like display areas, work areas, and hidden appliances and storage areas. Of course your new kitchen isn't "just" cabinets. Our designers will help you select a color scheme and advise on paint, tiles, counter-tops, flooring, and window treatments and appliances to help make your kitchen vision a reality. Our established relationships with preferred vendors help assure that you are spoiled for choice. 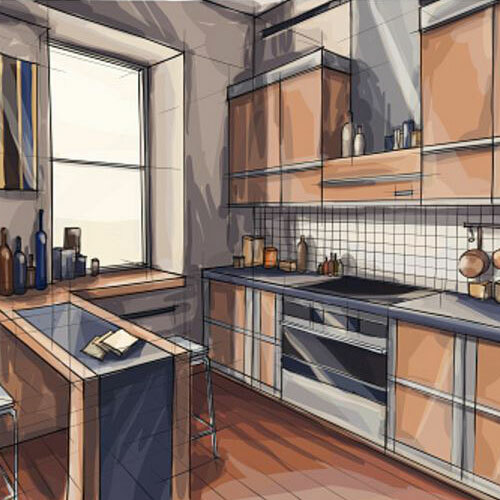 Having trouble deciding the look and feel that you want for your new kitchen? Check out our pinterest page of design ideas. After the designs have been approved and the cabinets, appliances, counter-tops, tiles, flooring, lighting, and other elements have been selected, it's time for the construction and installation phase. At Platinum Kitchen Designs, we understand that even the most exciting renovation or remodel can be stressful for homeowners. We work hard to minimize the disruption and the debris. Our firm is licensed and bonded and our construction staff are specially trained to work quickly, quietly, and with the utmost respect for your home and family. Our goal is 100% satisfaction because frankly, we want you back as a repeat customer for future renovation and remodeling needs and we want you to tell your friends about our terrific service and attention to detail. Our best advertisement is a happy customer and we work hard to earn that reputation.